Whenever we connect a removable drive to the computer we have to access it using Windows explorer. Wouldn’t it be nice if a shortcut gets created for the removable drive on Desktop when it is plugged to the computer in the same way it happens in Ubuntu Linux? 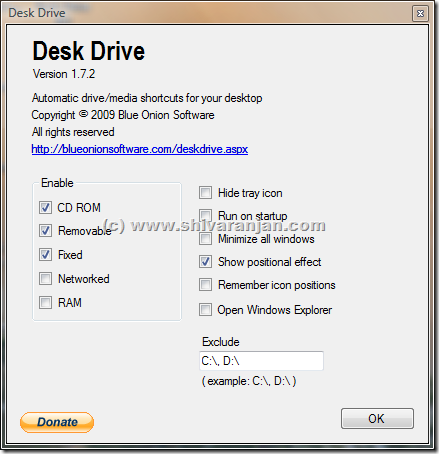 This can achieved in Windows using the free utility called Desk Drive. Desk Drive sits in the system tray and adds the shortcut of the drive once it is connected. A shortcut for the drive will be placed in the Desktop. When the drive is removed it will disappear automatically. Shortcuts for CD ROM drives, removable media, fixed drives, network drives and ram drives can be created by the Desk Drive. Option is provided to run this program at Windows startup. Ability to remember the icon positions. If you don’t want shortcut for a drive to be created then you can exclude that. We tested this with Windows XP and Windows Vista and found it to be working without any issues.